I’m laptopping you from an alpine-flowered slope above Two Jack Lake, near Banff, Alberta. Earlier today, at a First Nations’ powwow, Stoney elder David Daniels said, “These mountains were given to us by the Great Chief so that we might never be depressed.” He was making reference to some of the problems that plague native communities — drugs, alcoholism, teen suicide. As he spoke, his feathered regalia sparkled and rustled in the Champaign air. Rising up behind him was the silhouette of Mt. Rundle, one of the great peaks of the Canadian Rockies. What is it about mountains that awes and inspires us? Why do some artists never cease painting them? Perhaps for the same reason that we take their challenging paths and climb them — because they are there. Mountains in all their moods are symbols of something greater, something worth aspiring to. Mountains are powerful, dangerous, beautiful, noble and mysterious. Mountains get respect. Seen from a distance, mountains are affected by a full range of atmospheric interference. Ultra blues and grayed purples can dominate. 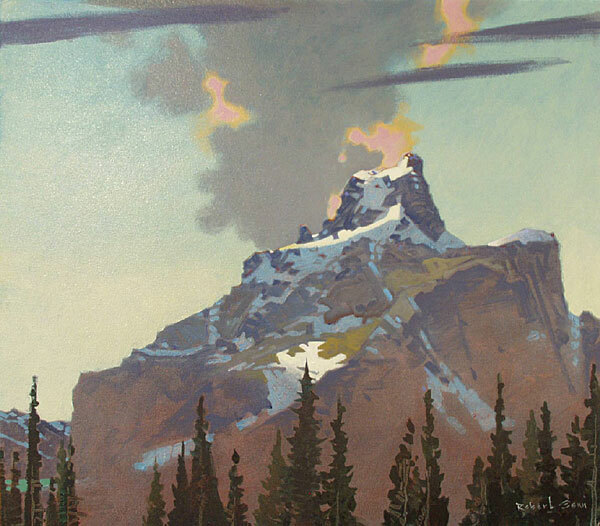 Like monuments they rise above clouds and out of valley mist — an endearing motif for artists. Up close, their flints and talus can be hard, sharp and unforgiving. The foreground and background up here practically always gives a contrast. Look for edge patterns and the way the sky sculpts the tops. The design of snow, when present, gives courage and activation to the upper end of a painting. Snow lies in predictable places, but often flirts in an arbitrary design — as if the Great Chief decided to go abstract just for fun. 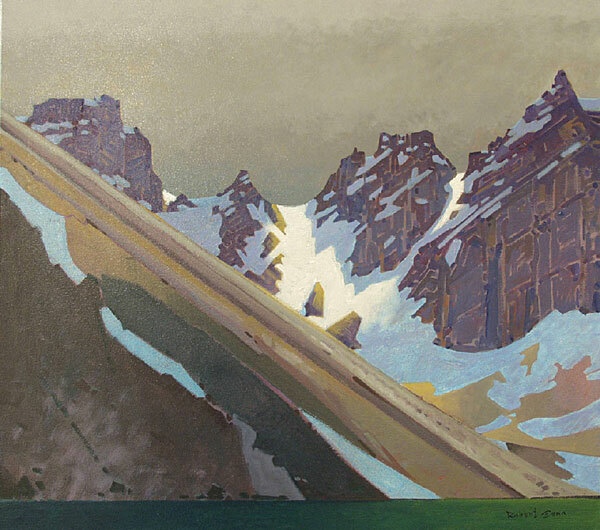 Esoterica: An appealing aspect of mountain art is the opportunity for what I call “graphic soundness.” The monumental nature of mountains invites strong trans-canvas design, linearity, lineups and diagonals coupled together with gradations and other compositional devices. While elusiveness and mystery are also desirable, this intellectualization of mountains seems to me to give them additional power. “Mountains are earth’s undecaying monuments,” noted Nathaniel Hawthorne in 1860. So you can get an idea of what we’re talking about, I’ve unmodestly asked Andrew to put up a couple of examples of my recent mountain work below. As a native Coloradoan who is living on the very flat coastal plain of North Carolina, my mouth is watering for just one mountain trip in my wonderful native state and to have my car climb its way up along the flanks of the high mountain passes (no matter what time of year, just as long as the road is open). You wrote about the wonder of mountains, no matter where they are. They are so solid, and so “just there.” Something you can really count on. Yet, they change from time of day to time of day, from season to season. Move your easel a little to the left or a little to the right and it’s a whole new mountain. New patches of snow to paint, new fleeting shadows, new crags to catch just right. And, yes, the air! Mountains thrill us to be small among such beauty and grandeur — it is the most ennobling kind of humility. Society and the company of men too often make us feel sad and impotent to be small among such malignant power, chaos and competition. How revealing that men who climb, often refer to the experience as ‘conquering’ a mountain rather than surviving it. Nature will always have the last say; we live here at her discretion, not ours. You are continuing on in your love affair with mountains, and like any other lover can chart the moods and contours of your loved one. Mountains figure in art historical examples, from Trecento depictions of hermits and saints in rocky terrain, to glimpsed backgrounds in windows in front of which portraits were made in the Renaissance. Durer and Elsheimer made studies of mountainous terrain. The German, Caspar D. Friedrich made paintings where studies of mountainous conditions informed the image. Hokusai did his famous series of woodcuts of the views of Mount Fuji. 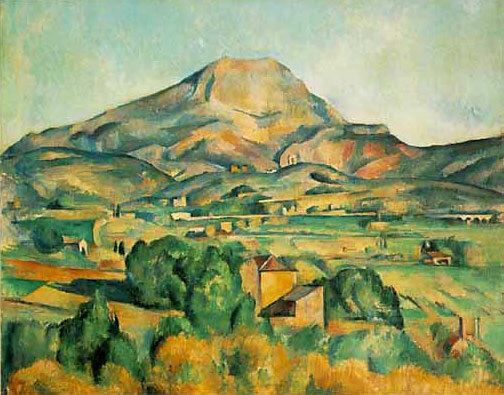 And of course there were those wonderful paintings Cezanne made of Mont St. Victoire. I am a Native American living near Yosemite. My children are native to Yosemite. We have a very rich and vibrant culture based in Yosemite. I have been doing art full time for just under a year. I do two types of MMA. That is “multi media art” and “mixed martial art.” That includes photography, videography, digital/computer art and ultimate fighting. I am doing everything I can think of to market myself but it’s slow going, I’m very busy training for my first fight on September 30th and I’m going to start giving tours in Yosemite for Yosemite Guides. I have gotten one lodge and one store to start carrying my photography. I have a non-profit environmental organization giving me photo assignments and paying me a small amount. I am also the photographer for several fight organizations but I haven’t made a penny from that. It’s prestigious, fun and exciting. I get to sit touching the cage and take photos. It is still costing me to do it, but it’s worth every penny because I love it. 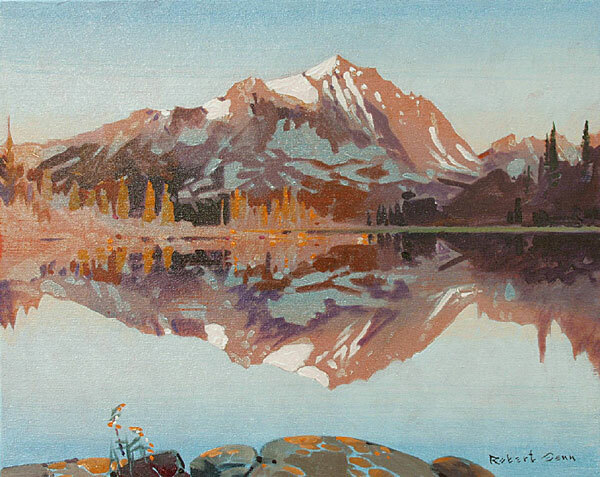 I really feel close to you there as I too love the mountains and painting them on location. I love John Muir, too. I had planned to go to Yosemite this summer but it is a bad mosquito year so I cancelled. 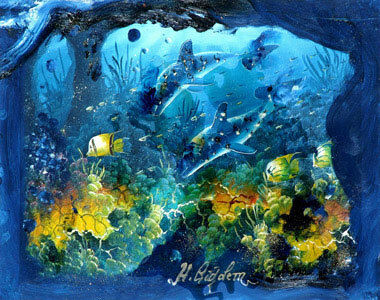 I wish to ask if your paintings are done 100% on location or did you use your jpegs online to paint from as well? (RG note) Thanks, Barbara. These days I’m doing only smaller paintings on location — up to 12 x 16 inches. I seldom finish on location. I bring the unfinished beginnings back to the studio, throw them around and throw some out. This is when, with a little luck, I pull them together. The glazing process which I use works better for me in the studio. The larger ones, as in the photos, are totally synthesized in the studio. Lately I’ve been using a Canon digital projector but my reference of choice is still slides. You might say that plein air, in my case, is a stimulating adjunct — an act in itself — which causes me to slow down, smell the daisies, reassess and restock the idea bank. 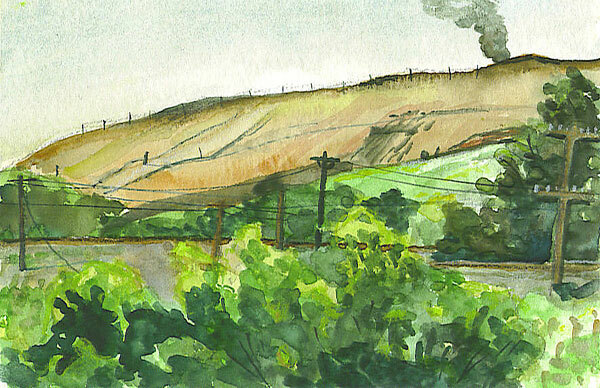 With the concomitant ct of plein air, I find myself to be less dependent on photos. Recently I took my five grandchildren and stayed for five days in the Lake Louise area. 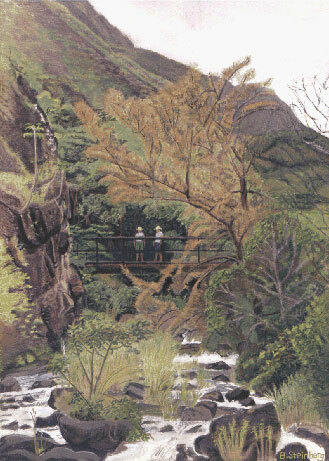 I started with a few plein air attempts to capture the beauty of this place. The atmospheric changes were very fast. At first I thought I would not be able to handle this. But it turned out that the fast and often half finished and underdone pieces were giving me more pleasure than laboriously ended paintings. So I am left with many “unfinished” works done for my soul and not for sale. My husband, Michael Campbell, and I just returned from a short trip to the Appalachian mountains of Virginia and West Virginia. I love the mountains and have never really been able to fully articulate why, other than feeling more grounded, strengthened, and awe-inspired by their presence. I am especially fond of the White Mountains of New Hampshire. I can’t seem to get enough of them and never want to leave when it’s time. I like European mountains because they’ve built really fine, serpentine roads on them that I’ve enjoyed driving on like a lunatic. But, being visual beings, mountains offer a break from the concrete world of city life and connect us to the raw power of nature and to gaze upon the stars at night shrinks our little daily human problems to nothingness. 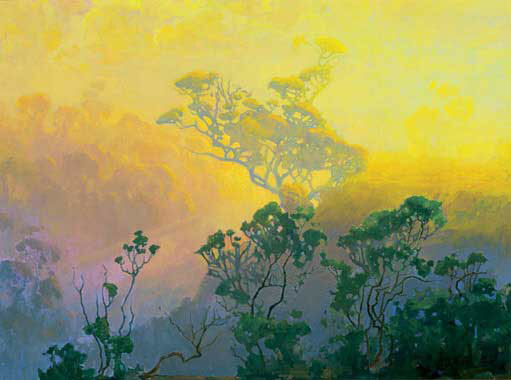 Mountain vistas provide a painter with a cornucopia of mood, atmosphere, substance, texture and the spectacle of how light dances on the mix of textures and color rendering a psychedelic wonderment of reality, a preternatural experience that amazes. It’s not profound, it just is. 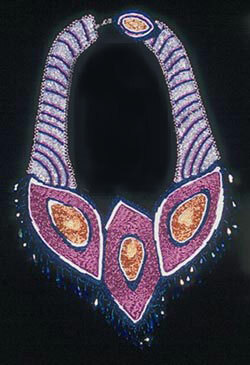 But, it’s the experience that matters and if painters can take a viewer on the experience, they’ve created a work of art. I’d venture to say that any landscape can offer the same sense of wonderment if we take the time to look closely and observe. 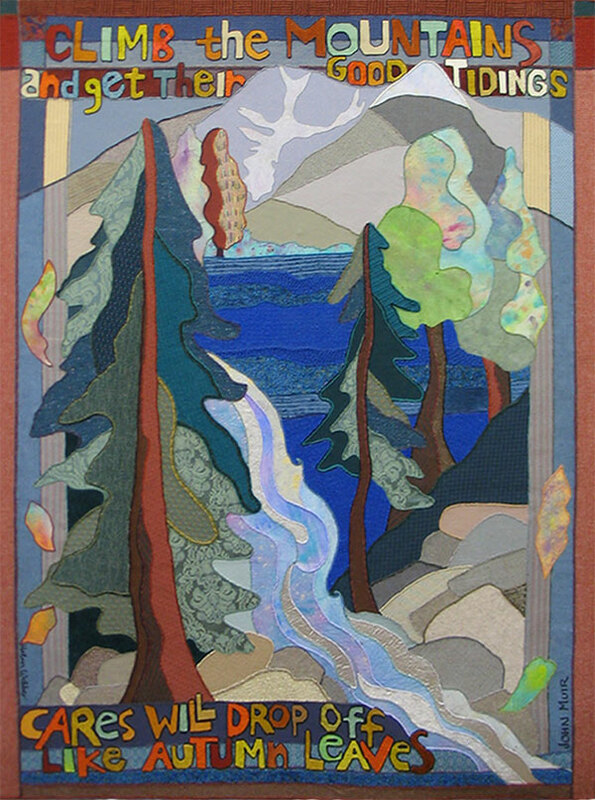 Speaking of John Muir, I recently completed a commission for a mountain climbing family living in Lake Tahoe. They selected a John Muir quote and I then created a six by four foot fabric collage tapestry. I could not help but think of Ansel Adams, perhaps because of my photography background. 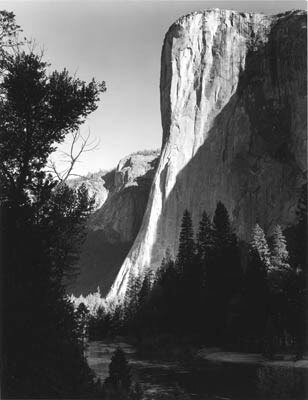 His explorations and studies of canyons and the Yosemite area make me wonder about how he would respond to your letter. Did his choice of subject dispel some sort of depression for him? Also I am intrigued by your choice of travel. I recently discovered the pleasure of traveling by train in Norway, going around the southern coast from Oslo to Stavanger as opposed to the trip over the mountains from Oslo to Bergen. I am a first generation Norwegian American, and I have a large family in Norway that I visit there often. If anyone is looking for travel ideas, they may want to consider a visit to Norway. Its vistas are extraordinary running the gamut from seaside fishing coves, pastoral hillside farms and up to craggy islands, soaring cliffs, deep fjords, glaciers and mountains. Government policy in Norway strongly encourages citizens to be outside exploring and communing with nature as frequently as possible. This is so different from the U.S. materialistic approach to life. 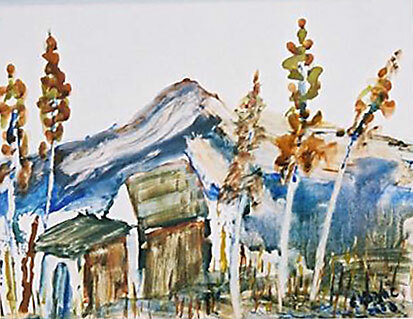 I have been flirting and dancing with colours, compositions and abstracts ever since I accidentally found my daddy’s paintings in a bookshelf at the age of 6. Art was inevitable in my life. I got the feeling that I may even modify the universe or at least recreate it. I am the first lady in Turkey who painted on her pantaloons. The pantaloons in question were given to a Greek artist in New York City and were danced in Central Park. I also do work on hats and hats by me with Prussian blue paintings have been distributed to people at Damrak Square in Amsterdam. I also painted on a dustbin of Sri Marinan Temple at Singapore. I painted the face of Maori and boat of Maori during my last visit to New Zealand. All my paintings are done with my fingers. Morning is breaking on the East Coast as I tap tap tap on the top top top on the key board. Fireweed stands tall outside my window. Its colour sings a story into my eyes. I have just read your letter composed on an alpine-flowered slope above Two Jack Lake. For a moment, in my mind, there was an ant that had made it to the top of an Indian Paintbrush swaying in that meadow. The ant looked at the mountain and read your thoughtful creation on the laptop screen. He saw that it was good but was passionately annoyed with the term ‘laptopping you.’ The ant, actually his name is Frank, was unsure if it is just him that doesn’t like the aesthetics of being laptopped, or if there are other people that feel the same way. He mentions this to his brother, Brian as they climb down the paint brush together and glance back at Mt. Rundle disappearing between grass blades. “Yeah” says Frank, “and I liked reading that guy Genn’s stuff. I just like picking up crumbs now and again.” Frank and Brian get back to work. So must I. (RG note) Thanks, Debbie. Having ‘laptopped’ people several times in these letters, I have often wondered if I was pushing the language a bit much. I rationalized that there is after all ‘lapdancing,’ which seems nice although I have not yet had it done. Also, even though I may be on an alpine-flowered slope, I still run the letter past the eyes of editors, among them professionals like Judi Birnberg in California and Lorna MacPhee in Ontario. While these experts have called me on all kinds of inexcusable literary boo-boos, there has not been a single peep about ‘laptopping’ in their often extensive deconstructions. Perhaps they’re thinking of Frank and Brian who, while ants and while initially critical, might also be sensitive to the possible birth of a new verb. For the time being Debbie, unless I hear differently, I’ll continue to laptop you every time I have the opportunity.